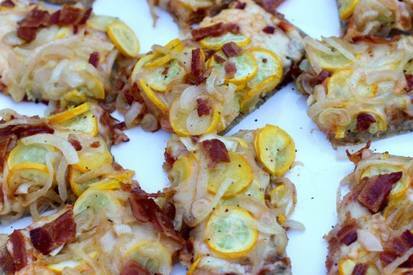 Bacon, squash & caramelized onion pizza! Sometimes my favorite meals come on nights I don’t have anything planned and don’t feel like going to the grocery store. This Bacon, summer squash, caramelized onion pizza is one of those recipes; I had some squash in my garden, an onion, Bacon and some pizza supplies in my fridge. I hoped it would turn out okay but I actually ended up loving it and I hope you do too.